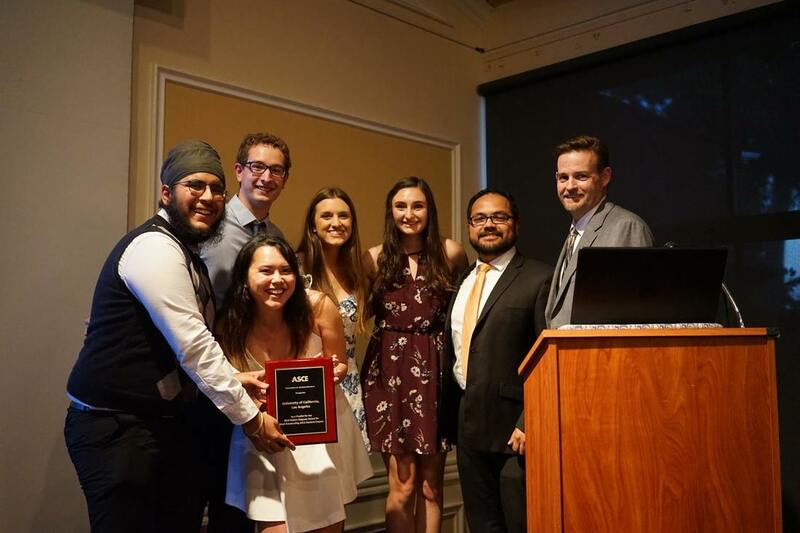 Our UCLA ASCE student chapter has a long history and an even longer list of awards! From membership awards to chapter recognitions, we take pride in our accomplishments. Here, we recognize the individual efforts and group accomplishments. This award is given in honor of Richard T. Shimano BS '89, MS '90 for his leadership, service, and dedication to the UCLA ASCE Student Chapter. This award is given to a graduating ASCE member who exhibits qualities of and to the chapter. Allison Woodworth receiving the 2018 Richard T. Shimano Leadership Award. The ASCE at UCLA Rising Star Scholarship is given to the younger members who are passionate and dedicated towards Civil Engineering and ASCE. The scholarship winners each receive a $500 award. 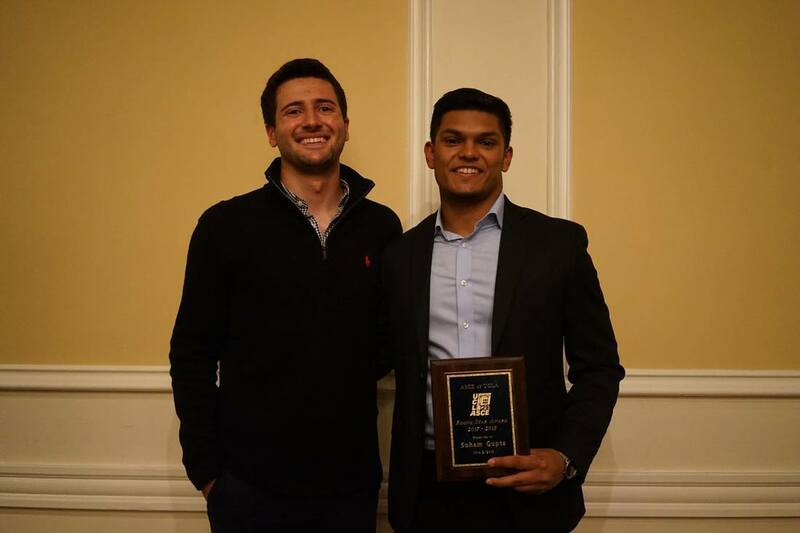 Soham Gupta receiving one of the two 2018 Rising Star Scholarships. Claire Killian accepting her second Rising Star Scholarship. Killian won the award in 2017 and in 2018. Our Project Awards show our achievements in competitions. They are only given to the school teams that earned a top-place finish in areas like design and overall team performance. Concrete Sports displaying its 1st place winning concrete frisbee at PSWC 2018. Chapter recognitions include overall Conference Awards from PSWC, UCLA Engineering Departmental Awards, ASCE LA Section Chapter Awards, and more! ASCE Core Officers receiving the Robert Ridgway Award from Jerry Burke, ASCE Los Angeles Section President, and Julian Garcia, ASCE Metropolitan Los Angeles Branch President. 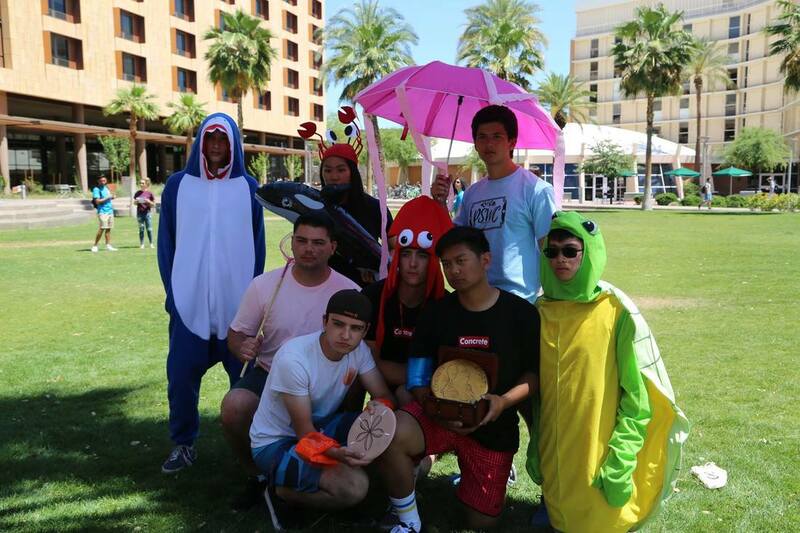 The UCLA ASCE chapter was selected from a field of over 300 colleges and universities from across the United States and more than 15 other countries. Project members also deserve recognition for their leadership and dedication to our projects. Each year, we recognize one Outstanding Project Manager, one Outstanding Project Director, and one Outstanding Project Engineer. Trini Inouye receiving the 2018 Project Manager of the Year Award for her enthusiasm and never-ending passion for GeoWall. Brandon Duong accepting the 2018 Project Director of the Year Award for his dedication and reliability in ASCE's Seismic Outreach Program. Ada Chang awarding Catherine Nguyen the 2018 Project Engineer of the Year Award for Nguyen's thirst for learning and strong leadership skills.